July 17, 2015 July 17, 2015 Nefer Khepri, Ph. D.
Have you ever seen a UFO? A UFO is simply an “unidentified flying object.” It can be anything. Classified as a UFO does not automatically indicate the craft is extraterrestrial. It can be a weather balloon, a misidentified plane or helicopter, or even a mirage or some other trick of the eye. Yet, there are cases reported around the world and plenty of photographic and video evidence for metallic round or cigar-shaped objects that cannot be explained. I saw a UFO when I was ten years old. 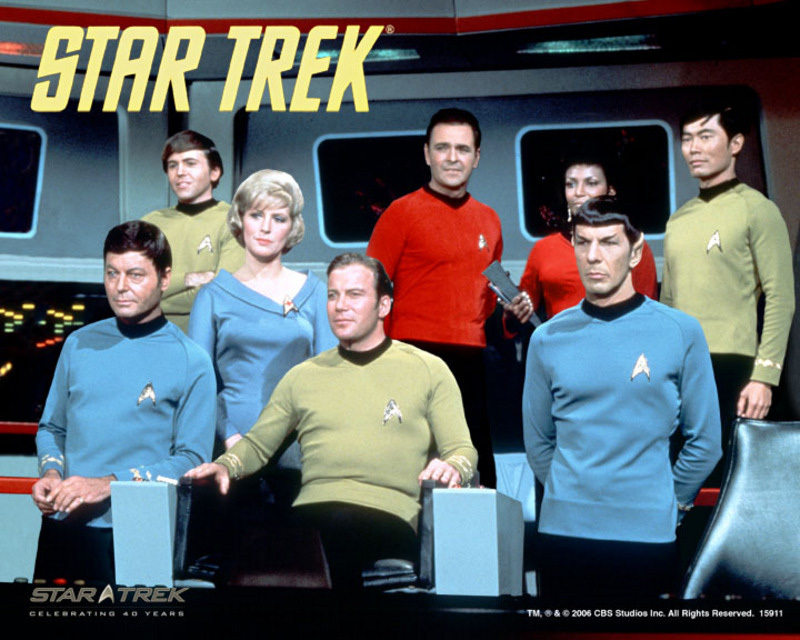 The Cast of the original Star Trek series. At the time I was heavily into “Star Trek,” which had just began to run in syndication. A friend and I were roller-skating on a side street half a block from my house. She was a year younger. It was a typical northern Illinois summer day: bright full sun, not a cloud in the sky, and hot. I wasn’t too keen on roller-skating because I wasn’t very good at it so I basically kept my eyes on the sidewalk directly in front of me. As I was looking down I could see a large shadow suddenly appear that encompassed the sidewalk, the street, and the front yard of the houses on either side of the street. This caused me to bring my gaze upward wondering what was creating the shadow. That’s when I saw it. My ten year old mind just went blank. I was looking at something that made NO sense to me whatsoever. I tried to tell myself it was plane, but it was hovering over a house. It did not exhibit any movement, nor did it make any sound whatsoever. It just hung there. The craft was larger than the house, which was the largest house on the block so I’d estimate the craft was approximately 1500 square feet in diameter. It just hung there in the air. I had stopped skating. My friend who was directly behind me bumped into me. As she said something to me all I did was point up. She looked and there was just silence. I have no idea how long we stood there gawking at the UFO. Perhaps it was mere seconds, maybe minutes. All I knew was that this image I was seeing did not compute. My brain kept telling me “that’s a plane, it must be!” But it was no plane. What type of plane is circular without any windows or external markings? As we stood there and I realized what we were looking at I turned to my friend and jokingly said, “Hey, maybe Scottie will beam us up if we can get his attention.” So like dumb kids will do stupid things we began screaming & waving at the craft. Thankfully, we were not beamed up. Instead, the craft was there one second, we began screaming and waving at it and then it simply wasn’t there. I didn’t know about wormholes at the time, but I figure the craft either slipped into one or had some other method of traveling interdimensionally. When the UFO disappeared that’s when it no longer was a game. We both started screaming in fright at that point. We roller-skated as fast as we could back to my house and rolled into the house still wearing the skates and screaming at my mom that we had just seen a UFO. And, that, in a nutshell is my UFO story. If you have one, feel free to share in the comments below.